February 12th 1816; the Teatro di San Carlo, the oldest working opera house in Europe, is destroyed by fire. The Real Teatro di San Carlo is an opera house in Naples, Italy. It is the oldest continuously active such venue in Europe and it is recognized as a UNESCO World Heritage site. Founded by the Bourbon Charles VII of Naples (Carlo VII in Italian) of the Spanish branch of the dynasty, the theatre was inaugurated on 4 November 1737 — the king's name day — with a performance of Domenico Sarro's Achille in Sciro, an opera based on the play by the famous poet and dramatist who went by the name of Metastasio. Sarro also conducted the orchestra in two ballets as intermezzi, created by Grossatesta. At the time, it was the largest opera house in the world, seating 3,300. The theatre was designed by the architects Giovanni Antonio Medrano and Angelo Carasale for the monarch since Charles wanted to endow Naples with a new and larger theatre to replace the old and dilapidated Teatro San Bartolomeo of 1621. The new theatre was much admired for its architecture, its gold decorations, and the sumptuous blue upholstery (blue and gold being the official colours of the Bourbons). On 12 February 1816 the San Carlo was destroyed by fire. However, it was re-designed by the architect Antonio Niccolini and rebuilt within ten months on order of King Ferdinand IV, another Bourbon monarch and son of Charles III. On 12 January 1817, the rebuilt theatre was inaugurated with Johann Simon Mayr's Il sogno di Partenope. Stendhal attended the second night of the inauguration and wrote: "There is nothing in all Europe, I won’t say comparable to this theatre, but which gives the slightest idea of what it is like..., it dazzles the eyes, it enraptures the soul...” It was designed as a traditional horseshoe-shaped auditorium with 1,444 seats, and the proscenium is 33.5m wide and 30m high. The stage is 34.5m deep. In 1844 there was a new redecoration under Niccolini his son Fausto and Francesco Maria dei Giudice. The main aspect of the new intervention has been the change of the theatre's interior appearance to the now-traditional red and gold. Apart from the creation of the orchestra pit suggested by Verdi in 1872, the installation of electricity in 1890, the subsequent abolition of the central chandelier and the construction of the new foyer and a new wing for dressing rooms, the theatre underwent no substantial changes until the bombing of the Second World War in 1943. However, the theatre was quickly repaired by the occupying Allied forces, and it re-opened within six months on 16 December 1943. At the time, Neapolitan opera enjoyed great success all over Europe, not only in the field of opera buffa but also in that of opera seria. The Neapolitan school of opera composers included Feo, Porpora, Traetta, Piccinni, Vinci, Anfossi, Durante, Jommelli, Cimarosa, Paisiello, Zingarelli, and Gazzaniga. 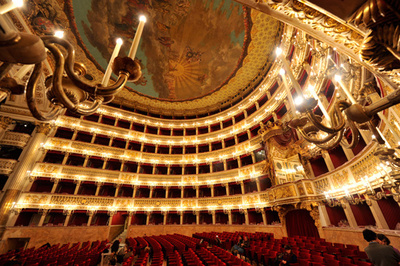 Naples became the capital of European music and even foreign composers considered the performance of their compositions at the San Carlo theatre as the goal of their career. These composers included Hasse (who later settled in Naples) Haydn, Johann Christian Bach and Gluck. Similarly the most prominent singers performed and consolidated their fame at the San Carlo, such as Lucrezia Anguiari, called "La Cocchetta." Other prominent singers who performed at San Carlo included the renowned castrati Giovanni Manzuoli, Caffarelli (Gaetano Majorano), Farinelli (Carlo Broschi), Gizziello (Gioacchino Conti) and Gian Battista Velluti, the last castrato. Caffarelli, Farinelli, and Gizziello were products of the local conservatories of Naples. From 1815 to 1822, Gioacchino Rossini was house composer and artistic director of the royal opera houses, including the San Carlo, and he wrote ten operas during this time. These were Elisabetta, regina d'Inghilterra (1815), La Gazzetta, Otello, ossia il Moro di Venezia (1816), Armida (1817), Mosè in Egitto, Ricciardo e Zoraide (1818), Ermione, Bianca e Falliero, Eduardo e Cristina, La donna del lago (1819), Maometto secondo (1820), and Zelmira (1822). Regular singers of the period included Manuel Garcia and his daughter Maria Malibran, Clorinda Corradi, Giuditta Pasta, Isabella Colbran, Giovanni Battista Rubini, Domenico Donzelli and the two great French rivals Adolphe Nourrit and Gilbert Duprez—the inventor of the C from the chest. After the composition of Zelmira, Rossini left Naples with Colbran who had previously been the lover of the theatre's impresario, Domenico Barbaja. The couple were married shortly thereafter. To replace Rossini, Barbaja first signed up Giovanni Pacini and then another rising star of Italian opera: Gaetano Donizetti. As artistic director of the royal opera houses, Donizetti remained in Naples from 1822 until 1838, composing sixteen operas for the theatre, among which Maria Stuarda (1834), Roberto Devereux (1837), Poliuto (1838) and the famous Lucia di Lammermoor (1835), written for soprano Tacchinardi-Persiani and for tenor Duprez. Vincenzo Bellini, Sicilian by birth, also staged his first work, Bianca e Gernando, at the San Carlo. Giuseppe Verdi was also associated with the theatre. In 1841, his Oberto Conte di San Bonifacio was performed there and in 1845 he wrote his first opera for the theatre, Alzira; a second, Luisa Miller, followed in 1849. His third should have been Gustavo III, but the censor made such siginifcant changes that it was never performed in that version nor under that title (until a re-created version was given in 2004). It was later performed in Rome with significant revisions to the plot and its location, while the title became Un ballo in maschera. Among the conductors and composers appointed by the Teatro San Carlo is the famous and eccentric French harpist and composer Nicolas Bochsa (1789-1856) who was accompanied by his "friend" the prima donna Anna Bishop with whom he was touring the world. He conducted several operas (1844-1845) in the San Carlo with Anna Bishop as prima donna. By the end of the nineteenth century and into the twentieth century, Giacomo Puccini and other composers of verismo operas, such as the great Pietro Mascagni, Leoncavallo, Giordano, and Cilea, staged their works there. The first public Opera House in Europe was in fact built in Venice in the 18th century, was destroyed by fire and the rebuilt to be called "La Fenice" (The Fenix). Naples indeed has the oldest continuously performing Opera House (the San Carlo as above described) testimony to the city's enormous contribution to music and theater. Moreover, Naples has, among other cultural treasures, the second oldest university in Europe after Bologna, built by Federic II, where both Aquinas and Vico taught philosophy. Not bad for a region which is allegedly retrograde vis a vis northern Italy. What a mistake to think that Italy begins with Rome and ends with Venice.